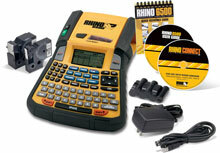 The Dymo Rhino 6500 has been discontinued. No direct replacement is available. The Rhino 6500 is ideal for assembly shop environments such as panel builders, wire harness shops or any place that you would like to kit labels and bring on the worksite. Power, speed and ease-of-use are Rhino's signature qualities and now they are available in a desktop model for the very first time. Just format labels using Rhino Connect software and with a touch of the Auto-cutter button, all your labels will be printed, cut and ready for your assembly department. Of course, the Rhino 6500 is also perfect for facility management as well as electrical, datacom, Pro A/V and other system installations. It's ability to download PC files ensures that labels are standardized for multiple buildings or multi-site projects. With Rhino's largest array of advanced features, you"ll love having the power of a Rhino right on your desktop. Includes: Label Printer, RHINO CONNECT Software, 1" black on white flexible nylon label cartridge, 3/8" black on white vinyl label cartridge, lithium-ion rechargeable battery pack, AC adapter, USB cable quick reference guide, registration card.